Just got fascinated as I have not seen this before. I have a 30ft long raised planter with flat timber top(to sit on). This morning the whole length was a pattern of droplets in which was a dot of pollen in each. How strange - and nice is that! Gets even stranger. Once the droplets of water dried every wooden surface - table, planter surround, tops of fences were all polka dotted I couldn't have designed it myself if I had wanted to. The dots of pollen (I think it is pollen)are nicely stuck so will have to be scrubbed off. None of the other flat surfaces which are plastic - oil tank, coal bunker, wheelie bins etc have this. So now I am intrigued and would love to know the answer - as yet I have not come up with one. 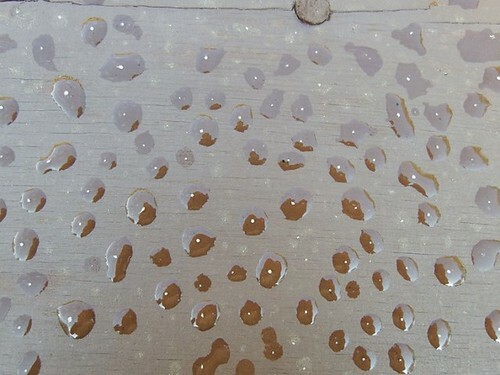 My guess, and it is purely a guess, is that the raindrops formed around the pollen in the atmosphere, (and may not have formed if the pollen wasn't present) and the result is what you see on your timber bench: they all slid off the plastic. From google:- Raindrops begin forming when water vapour condenses on micrometer-sized particles of dust floating in the atmosphere. 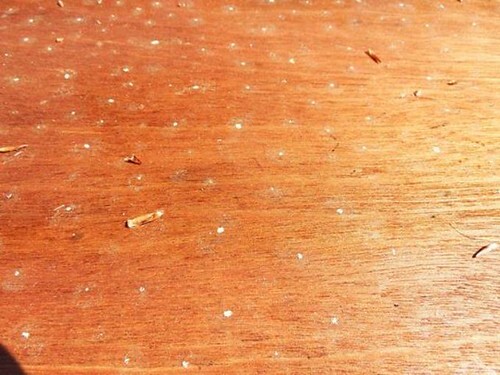 The dust particles grow to millimeter-sized droplets, which are heavy enough to begin falling.